Present: Sri G. Srinivas, I.A.S,. 2.U.O.Note No.2890/Plg.VII/2017 dated 21.012.2017 of the Planning Department (VII) Government of Andhra Pradesh. 1. Last three years significant achievements (year-wise) on all the Govt., schemes being implemented by the department. Therefore, all the District Educational Officers in the state are instructed to give necessary instructions to all the Deputy Educational Officers, Mandal Educational Officers, Headmasters concerned to follow the instructions scrupulously. 1. Prepare Education profiles at School, Village, Mandal, Division, Constituency and district levels. 3. Conduct various Competitions / Cultural programmes on nine themes in nine days i.e from 2nd January, 2018 to 10th January,2018. 4. 10th day in the Janmabhoomi – Maavooru programme is celebrated as Award Distribution – Fostering Happiness. 5. All Grievances / Hon’ble CM Assurances are to be redressed at their levels before commencing JBMV. 6. 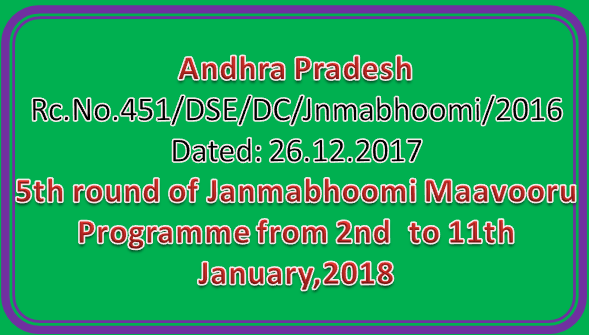 All the RJDSEs, DEOs, Dy.EO, MEOs, Headmasters, Principals of IASEs and DIETs are instructed to participate in the “Janmabhoomi Maavooru” programme from 2nd January, 2018 to 11th January,2018 with relevant information. 7. All the RJDSEs, Dy.EO, MEOs, Headmasters, Principals of IASEs and DIETs are instructed to submit a report regarding the conduct of Janmabhoomi programme to the DEO concerned by 5.00 PM on the day itself so as the DEO will submit the same with consolidated to this office daily through mail i.e mvkreddyjd@gmail.com and designcell.dseap@gmail.com. This has got approval of the Commissioner of School Education, Andhra Pradesh, Amavarati.